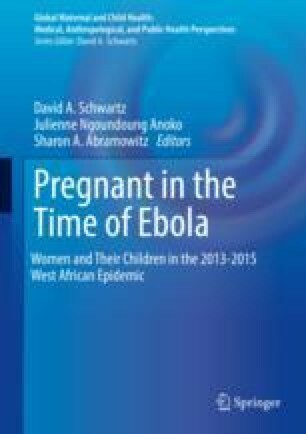 Pregnant, laboring, and postpartum women represented a particularly vulnerable population during the 2013–2015 Ebola epidemic in Sierra Leone. While scholarship has explored factors related to risk, infectiousness, and the medical difficulties in treating this population, few studies have examined this topic from the perspective of health care workers themselves. To address this gap, we conducted a qualitative study to explore the subjective experiences of health care providers working with this difficult-to-treat population. Data were collected between 2015 and 2017 as part of the Ebola 100 Project, an interdisciplinary research initiative that seeks to capture the stories of those who contributed to ending the West African Ebola epidemic. Via in-depth interviews (N = 30) with both Sierra Leonean and expatriate nurses, physicians, midwives, and traditional birth attendants, we examine how health care workers navigated the moral and practical dilemmas in attending to pregnant and laboring women in a context of both fear and medical uncertainty. Our findings indicate that the emergence of Ebola was particularly traumatic for local care providers, whose tenuous employment and the neglected state of maternal health nationally, as well as community distrust, stigmatization, and personal experiences of loss, made their jobs especially difficult. International care providers, used to working in higher-resource settings, often struggled to maintain a sense of relative control and safety by properly managing risk. This they did via repeat trainings, meticulous adherence to procedures, and the creation of strict guidelines, which often by necessity prioritized their own safety and that of the public before their patients. As the epidemic waned, however, shifts in risk management occurred, and local knowledge and “gut instinct” blended with more objective criteria around clinical decision-making. These findings speak to the diverse experiences surrounding care practices during the Ebola epidemic and have relevance both for the current health care landscape in Sierra Leone and for informing future global health responses of this nature. Médecins Sans Frontières. (2014, October 16). Sierra Leone: MSF suspends emergency pediatric and maternal services in Gondama. Retrieved December 7, 2017, from http://www.doctorswithoutborders.org/article/sierra-leone-msf-suspends-emergency-pediatric-and-maternal-services-gondama.